This fluted point was found several years ago in a cultivated field on the Ready-Lincoln Hills site in Jersey County, Illinois. 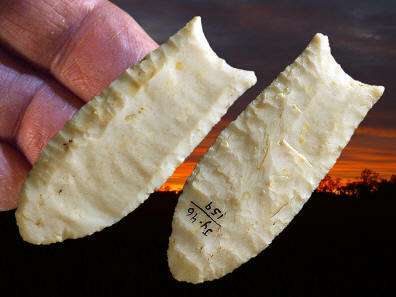 It's an example of an eastern style Folsom point and the only one that was found on the Ready-Lincoln Hills site. Most Folsom points have been found west of the Mississippi River. One side is fluted to the tip and the other side has a small narrow flute that measures 5/8 inch (1.6 cm) long. This point is made of white Burlington chert and it measures 1 13/16 inches (4.6 cm) long. This site was originally known as the Ready site (pronounced Reedy) and later as the Lincoln Hills site. The Ready-Lincoln Hills site is the largest Early Paleo-Indian camp and stone tool manufacturing site in an area near the confluence of the Mississippi, Missouri and Illinois Rivers. The site is on a cultivated field that measures about 2.7 acres (1.1 ha). The main lithic source was high quality Burlington chert that was available from local outcrops along valley walls and stream beds. The Ready-Lincoln Hills site produced a large collection of Clovis manufacturing debris in the form of broken and discarded fluted bifaces, point preforms and other miscellaneous unifacial tools. The site collection contained 224 fluted bifaces that were determined to be manufacturing rejects.